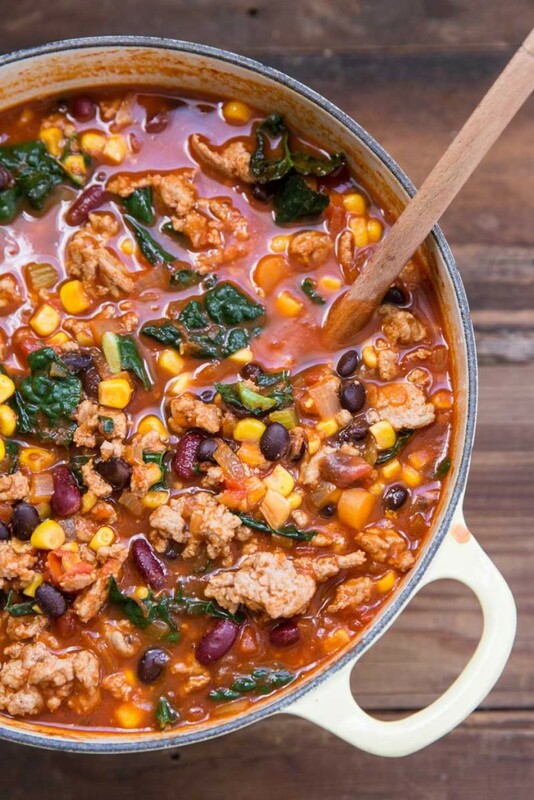 This Turkey Chili is hearty and filling to say the least and nourishing for all those we feed it to. The doctor sent us home with just a few requirements for this month pre -surgery for Everett- keep him well hydrated, healthy, and have him eat lots of fruits and veggies. 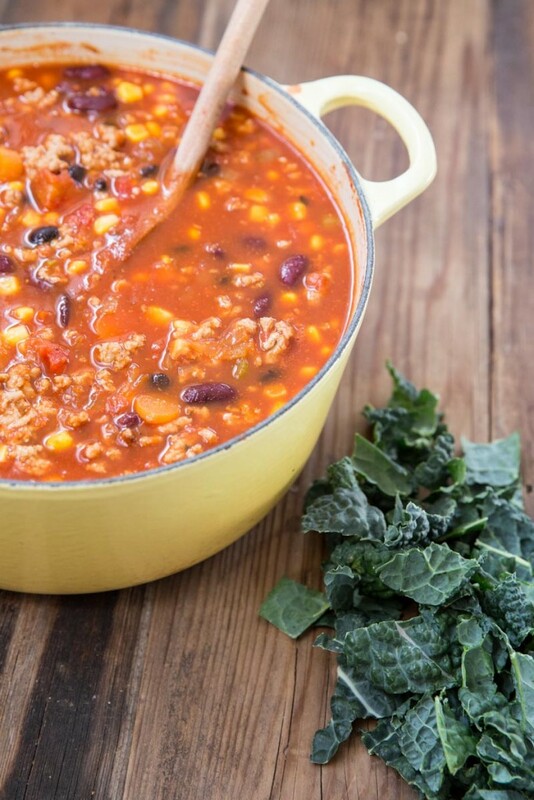 Well our breakfasts have been filled with berries, lunches paired with green smoothies or beets, and dinners of bowls like this Turkey Chili with a extra handful or two of kale added in just right before serving. Adding kale to the end of soups, stews, and chills like this one is a perfect way to add in a few extra nutrients. 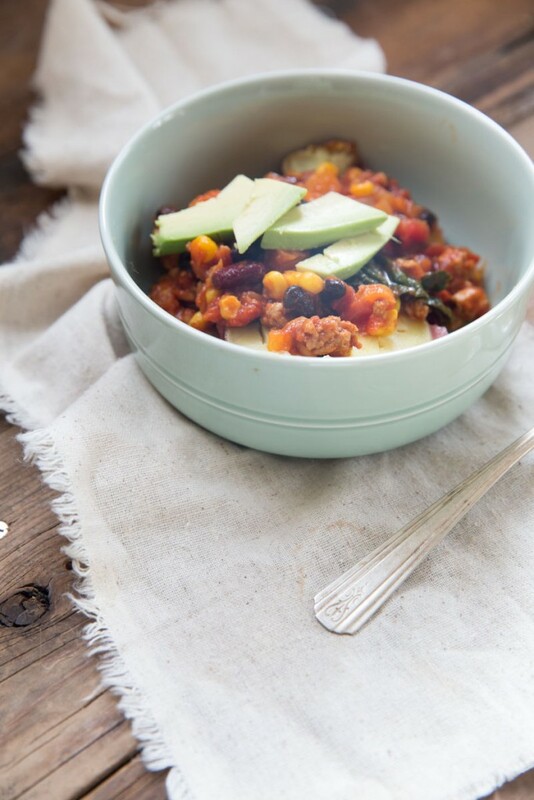 Sometimes we also like to throw in quinoa to our chili like this Chili recipe. There are so many ways moms have adapted recipes to be more nutritious for their little ones and this is just another. I also threw in chopped spinach and broccoli to a quinoa bake the other day and all in our family loved it. 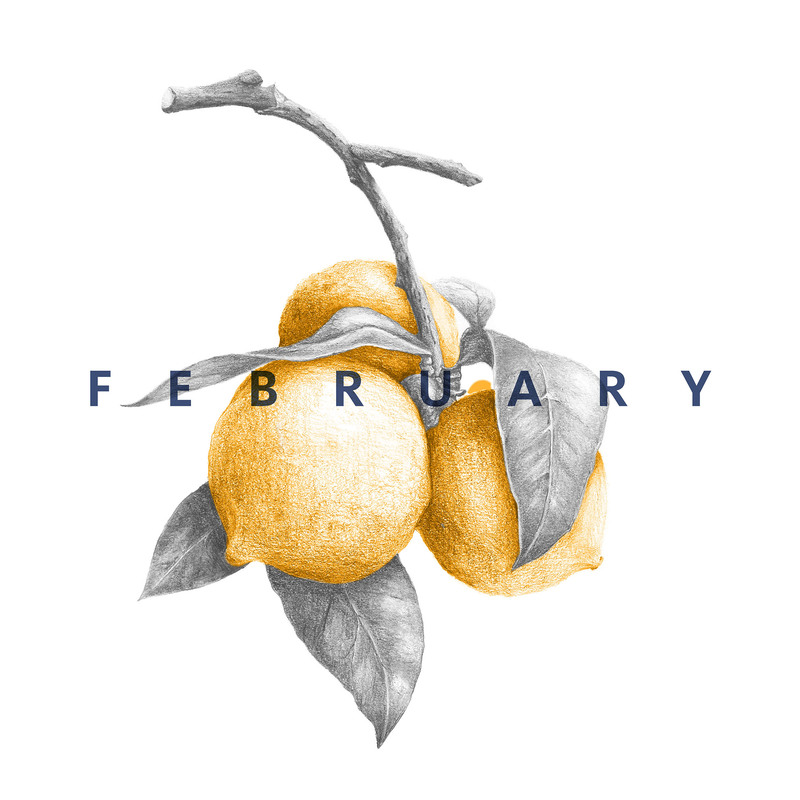 Besides loading up on veggies and fruits this month I’ve been preparing my mind for surgery. As a friend of mine said, ‘Kids are resilient, this surgery will be harder for you than him.’ Though its hard for my mother’s heart to believe I do need to face the reality of how hard emotionally this will be for me. I’ve been covering myself in reminders of who Jesus is so far this month, returning to one of my favorite books, John, which will help protect my mind through the hard coming month. Here are some truths I’m resting in. 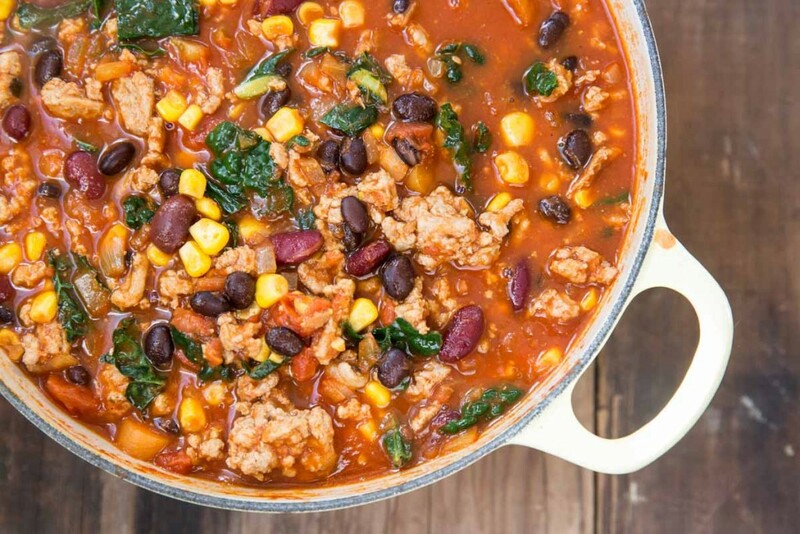 A quick and healthy turkey chili recipe with beans, corn, and kale. Heat oil in a large soup pot over medium high heat. Add in the ground turkey and brown. Use a spatula to flip and break up the turkey as it cooks but don't stir too often or the meat won't brown. Season with half of the salt and pepper. Cook for 6-8 minutes then transfer to a paper towel lined plate to drain. Use 1/2 of the leftover grease or juices from the meat to cook the onion, celery and carrots. Sauté for 2-3 minutes then add in the garlic and continue to cook for 30 more seconds. Add in seasonings, including the other half of the salt and pepper. Then add in tomato paste and brown sugar. Cook, coating the onions in the spices for 2 minutes. Add in the crushed tomatoes and use a wooden spoon to stir and scrape up any brown bits from the bottom of the pan.Add in chicken broth then cooked turkey. Simmer for 10 minutes. 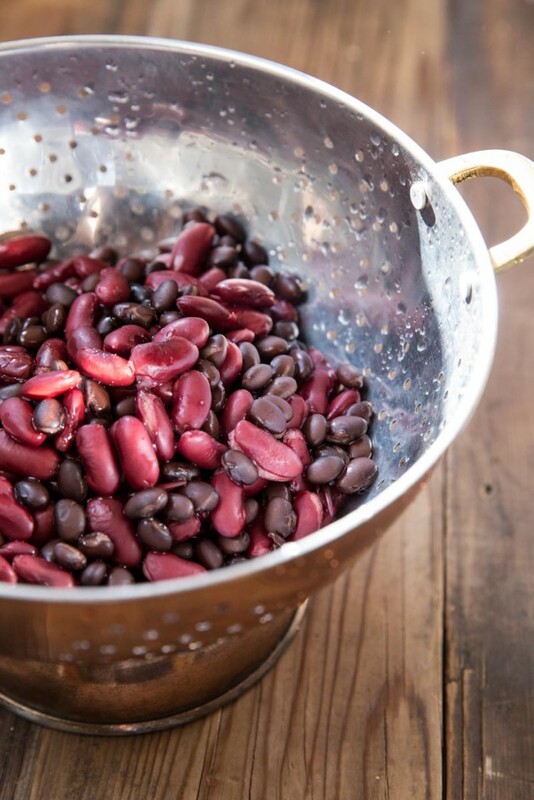 Add in the drained beans. Drain just half of the corn juices (if using canned) and add the corn plus its juices to the pot. Stir in the kale until wilted, 1-2 minutes or less. Serve over roasted sweet potatoes with slices of avocado. Tasty! I’ve added two tablespoons to fire it up! awesome! Definitely turn up the chili powder if you like it extra spicy! 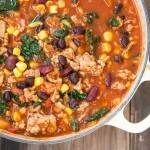 Turkey chili is my favorite ever, and after seeing this I have the biggest craving for it now! It’s raining out and this would perfect for my dinner. I love that you added kale too! Marcie, I love a good hearty chili too! Hope you enjoy some chili or something warm and comforting on this rainy day! Definitely! You’ll just want to add more liquid too as the quinoa or lentils will soak it all up. Add 2 cups more liquid per 1 cup of lentils or quinoa. Let me know how it turns out! Lazy question ahead… Can I substitute the chili powder, oregano, cumin, etc for one of those pre-made chili packets? I’m sure that will do the job! Let me know how it turns out! 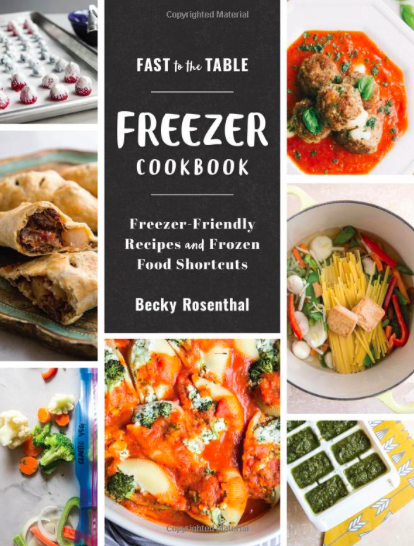 We love your chili recipe at our house, Becky! Making it again for a crowd this weekend. Thanks!! Thanks so much Leigh for the note!! It’s always good to hear that my recipes are being enjoyed! Blessings to you and your sweet family!! Bless you for this sweet comment! Glad you enjoyed it! Hi, Does this freeze well? Looking forward to trying this recipe. Looks delicious! This freezes very well! Enjoy!